The Central Asian country torn by the civil war remains one of the main security threats to regional countries. In addition to the confrontation with the Taliban, the legitimacy of the government of President Ashraf Ghani is disputed by the "Islamic State" that migrated from Syria and Iraq to Afghanistan. Thus, the threat of terrorism for the member countries of the organization comes first of all from the territory of Afghanistan. Since the end of 2017, the leaders of IGIL have managed to transfer about 500 foreign fighters from Syria and Iraq to Afghanistan. According to the intelligence agencies of Russia and China, the number of ISIS fighters in Afghanistan amounts to 4000 people, consisting of 160 cells. The main stronghold of terrorists is Nangarhar province on the Afghan-Pakistan border. All countries in the region have an interest in stabilizing the situation in Afghanistan. China fears for its "New Silk Road" project, passing through Central Asia, and the possibility of activating ISIS in the Muslim Xinjiang Uygur Autonomous Region of China. In the ISIS ranks in Iraq and Syria, thousands of Uighurs fought. The penetration of terrorists into the Central Asian republics, with which (apart from Turkmenistan) Russia has "open borders" - a direct threat to Russian security. Iran has a long 900-kilometer border with Afghanistan, which can also be crossed by Islamists. Here, on both sides of the border, there is an ethnic minority of Baluchis, who if possible are able to create their own state (Balochistan) in the territory of Iran, Afghanistan and Pakistan. As for India, it is interested in fighting ISIS for the same reasons as China. Firstly, because of fear of penetration of terrorists into Muslim Indian states. Secondly, stability in Afghanistan is necessary for the implementation of the TAPI gas pipeline (Turkmenistan-Afghanistan-Pakistan-India). On May 21 in Kandahar, the Taliban stronghold, militants killed five specialists who conducted an inspection of TAPI construction sites. All of the above risks are relevant for Pakistan, which has the longest border with Afghanistan (2,670 km). Along it live tribes of Pashtuns, whose support is used by the Taliban. In addition to the threat of ISIS and the separatism of the Balochs, Islamabad fears a strengthening in the region of India. Under the administration of President Donald Trump, the United States has sharply deteriorated relations with Pakistan, which the Americans accused of supporting the Taliban. Washington decided to bet on India, actively involving it in the Afghan settlement. The unification of the efforts of regional countries, despite the presence of rivalry (China and Pakistan against India), is important in order to prevent unilateral and destabilizing actions by the United States, which believe that it is possible to resolve the conflict by dropping the "mother of all bombs". In recent years, the SCO has expanded its membership. In June 2017, India and Pakistan became full members of the organization, whose main task was the fight against terrorism. 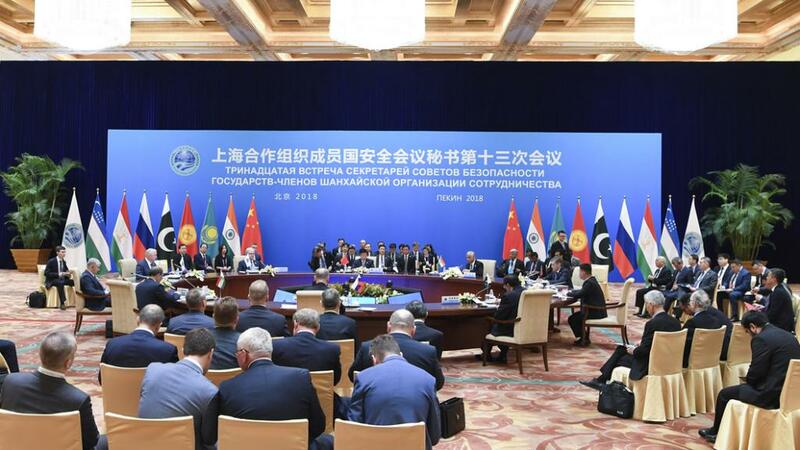 Iran, having observer status, Egypt, Iraq, Israel, Turkey (dialogue partner) and a number of other countries are applying for participation in the SCO. In the future, the SCO can become the same political platform for Afghanistan, which today is Astana for Syria. Both here and there, at first glance, irreconcilable historical rivals are involved in the process. In Syria, before the start of the Astana process, Iran and Russia confronted the pro-American line of Turkey, which supports the Syrian opposition. In Afghanistan, the influence of India, stimulated by the United States, restrains the alliance between Pakistan and China. However, understanding the commonality of interests - both economic and security - can lead to a situational alliance that will repel forces that prevent the stabilization of Afghanistan.